For patients who are missing one or more of their natural teeth, dental implants present a potentially ideal solution. Dental implants are the only restorative dentistry option that allows patients to fully reconstruct a missing tooth, from root to crown. Made of strong titanium, the dental implant posts are embedded securely in the jawbone where they provide unrivaled support for crowns, bridges, and even full sets of dentures. 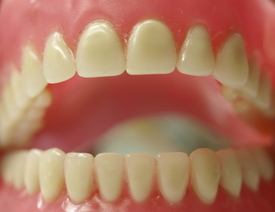 Indeed, it is denture wearers who may derive the most obvious benefit from dental implants. Even when they are custom crafted to fit comfortably in a patient’s mouth, traditional removable dentures are at risk of slipping or shifting out of place. They can interfere with speaking, biting, and chewing, and they can be extremely cumbersome. Unfortunately, millions of Americans have dentures that aren’t made to the most exacting standards; these people have to struggle daily with uncomfortable dentures that don’t fit properly and even cause painful sores in their mouths. Thankfully, implant-supported dentures provide an outstanding alternative to patients of our Red Bank cosmetic dentistry practice.If you currently wear dentures, or if you need dentures for the first time, you owe it to yourself to find out more about implant-supported dentures. At our cosmetic dentistry practice in Red Bank, dentures are customized to fit comfortably yet snugly in our patients’ mouths while being practically indistinguishable from natural teeth in terms of their appearance. That said, even the finest removable dentures cannot compare to their implant-supported counterparts, especially in terms of their oral health benefits. When a tooth is lost, the body interprets the missing tooth as a signal that the tissues that once supported the tooth no longer have any practical function. As a result, those gum and bone tissues begin to degrade. When multiple teeth are missing, this can cause significant damage to the jawbone in particular, leading to the “hollowed out” look that is common in people who have been missing teeth for a long time. At the same time, any remaining natural teeth will begin to shift out of their optimal position in the mouth, drifting toward the gap where the missing tooth once resided. The entire mouth becomes more susceptible to disease and infection, while the bite becomes weakened. Dental implants halt this degradation by signaling to the body that the structures of the mouth are once again providing a necessary function. Because the body does not recognize titanium as a foreign substance, dental implants essentially become part of the patient’s natural anatomy, and oral health is restored. Our Red Bank full mouth reconstruction patients once again have a mouth full of teeth that function, feel, and look just like their natural teeth. Are You a Good Candidate for Implant-supported Dentures? If you are missing your natural teeth and have sufficient bone density to support dental implants, chances are you are a good candidate for implant-supported dentures. If you lack sufficient jawbone, you may have to undergo a bone grafting procedure before you can be fitted with dental implants. To find out whether you are a suitable candidate for implant-supported dentures, we urge you to contact our cosmetic dentist in Red Bank today.